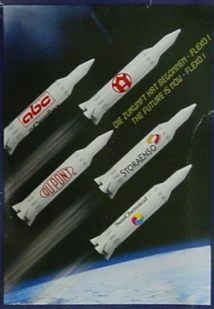 This promo was given away at the drupa 2000 - the print media trade fair. Drupa is an international event, and it took place from 18 to 31 May 2000, in Düsseldorf, Germany. 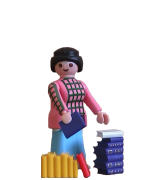 According to the fair's Marketing/Communication Department, this playmobil® DRUPA edition was not produced by Messe Düsseldorf - it was one of the exhibitors that handed out such figures during the fair. 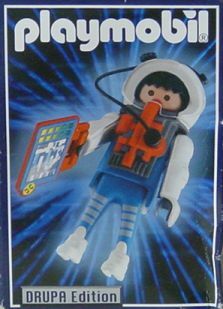 The figure is a pretty common astronaut, but the box is of a dark blue color, like most of the space sets that came out around that time. Oddly, inside there's the kind of baggie that usually packages unboxed promos, instead of the common bags. 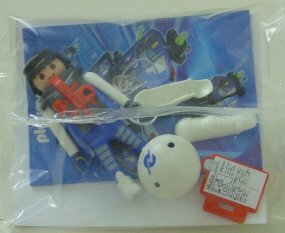 Though the box depicts a different pad, the one that actually came with him was an accident report. I wonder if it was a mistake in this particular box or if they all came out like that? If anyone has this item I'd appreciate some light on that - just email me. 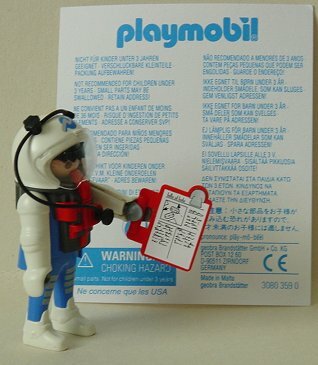 WHY would an astronaut have an accident report!? Maybe he actually is a space traffic cop, and things up there are a lot more crowded and complicated than anyone imagines?